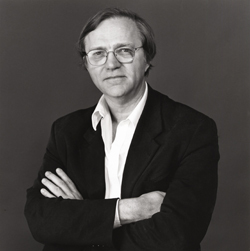 Robert Storr, dean of the Yale University School of Art and a former senior curator at the Museum of Modern Art (MoMA), will deliver the keynote address during Convocation at the 2013 Annual Conference in New York. Convocation, which includes the presentation of the 2013 CAA Awards for Distinction, will take place on Wednesday evening, February 13, from 5:30 to 7:00 PM. Free and open to the public, the event will be held in the East Ballroom, on the second floor of the Hilton New York in midtown Manhattan. Storr joined the Department of Painting and Sculpture at MoMA in 1990, where he has organized solo exhibitions on Elizabeth Murray (2005–6), Max Beckmann (2003), Gerhard Richter (2002), Chuck Close (1998), Tony Smith (1998), and Robert Ryman (1993–94). He also coordinated the Projects series at the museum from 1990 to 2000. More recently, Storr served as commissioner of the 2007 Venice Biennale, which was titled Think with the Senses, Feel with the Mind: Art in the Present Tense. He was the first American invited to the position. A painter and a critic, Storr has written on art for Art in America, where he has been a contributing editor since 1981, and for Frieze, where he wrote a regular column from 2004 to 2011. In addition to publishing books on Close and Philip Guston, he has recently completed Intimate Geometries: The Work and Life of Louise Bourgeois (forthcoming). Storr earned a BA from Swarthmore College in 1972 and an MFA from the School of the Art Institute of Chicago in 1978. The recipient of numerous grants, awards, and honors, he has lectured at colleges and universities throughout the northeastern United States. Storr began his official academic career in 2002, leaving MoMA to become the first Rosalie Solow Professor of Modern Art at New York University’s Institute of Fine Arts. Storr joined Yale in 2006 as dean and was recently reappointed to that position for a second five-year term. He is also professor of painting and printmaking at his school. Storr has intersected with CAA at various points throughout his career. He has chaired several Annual Conference sessions and has spoken on even more. He served on the Art Journal Editorial Board from 1985 to 1995 and, with the attorney Barbara Hoffman, guest edited two issues on censorship and the visual arts, in fall and winter 1991. A ever-passionate advocate, Storr took up the issue again in 2011, writing a piece in Frieze on the Hide/Seek controversy. On Tuesday, February 12, a day before Convocation, Storr will participate on a panel, titled “Hands On,” at the New York Studio School in Greenwich Village. Joining him will be the art historians Svetlana Alpers, professor emerita at the University of California, Berkeley, and David Rosand, Meyer Schapiro Professor of Art History Emeritus at Columbia University, who will discuss the connections between making art and writing about it. David Cohen, an art critic and the editor of Artcritical.com, will moderate. The event, starting at 6:30 PM, is free and open to the public; seating, however, may be limited. Please read the full article to learn more about the twenty recipients, who come from the Caribbean, South America, Europe, Africa, and Asia. CAA is delighted by the range of interests and accomplishments of this year’s grant recipients and looks forward to welcoming them in New York. Image: Ding Ning, a professor and vice dean of the School of Arts at Peking University in China, is a 2013 travel-grant recipient. CAA is pleased to announce the finalists for the 2013 Charles Rufus Morey Book Award and the Alfred H. Barr Jr. Award. The winners of both prizes, along with the recipients of ten other Awards for Distinction, will be announced in January and presented during Convocation in New York, in conjunction with the 101st Annual Conference. The presentation of the 2013 Awards for Distinction will take place on Wednesday evening, February 13, 5:30–7:00 PM, at the Hilton New York. The event is free and open to the public. For more information about CAA’s Awards for Distinction, please contact Lauren Stark, CAA manager of programs and archivist. Students and emerging professionals have the opportunity to sign up for a twenty-minute practice interview at the 2013 Annual Conference in New York. Organized by the Student and Emerging Professionals Committee, Mock Interview Sessions give participants the chance to practice their interview skills one on one with a seasoned professional, improve their effectiveness during interviews, and hone their elevator speech. Interviewers also provide candid feedback on application packets. Mock Interview Sessions are offered free of charge; you must be a CAA member to participate. Sessions are filled by appointment only and scheduled for Thursday, February 14, 10:00 AM–NOON and 4:00–6:00 PM; and Friday, February 15, 10:00 AM–NOON and 4:00–6:00 PM. Conference registration, while encouraged, is not necessary to participate. To apply, download, complete, and send the Mock Interview Sessions form to Jennifer Stoneking-Stewart, chair of the Student and Emerging Professionals Committee. You may enroll in one twenty-minute session. Deadline extended: February 13, 2013. Onsite enrollment will be limited and first-come, first-served. Sign up in the Student and Emerging Professionals Lounge starting on Thursday, February 14, at 8:00 AM. The Coalition on Contingent Academic Labor (COCAL X) and the United Association for Labor Education (UALE) seek participation in the On Line Teaching Working Conditions Survey from all faculty members who teach online for the purpose of gaining information on wages and working conditions. The organizers hope that the results will lead to organizing for improvements. CAA encourages you to take the survey and to forward its link to any relevant lists or individuals. The survey is for anyone teaching online in colleges or universities. The project committee aims to collect a range of working conditions: how much people get paid, how many hours they work, whether they have union representation, how many students they have in a class, and so on. When the committee collects enough responses to get a sense of what’s out there, it will categorize the examples as “good,” “bad,” and “ugly” in an attempt to establish some kind of standard of what decent working conditions for online teachers—who are suspected to be largely contingent—might look like. If you do not want to give your name when completing the survey, simply type in random letters in the box for the first question. No names of individuals will appear in the final (or draft) report, and no raw data will be circulated outside the committee that is working on the project. However, the group does need the name of your institution, the one through which you are teaching the class with the working conditions that you are describing. Please complete this survey even if you filled out the previous draft survey. The current one has been updated to reflect comments that the organizers received from those who took the previous survey. For more information on the survey or the project, please contact Helena Worthen for COCAL X and UALE’s On-Line Teaching Working Group.